Climb aboard the famous White Pass & Yukon Route train, and step back in time when the railroad first carried weary miners toward their destination in the Klondike. 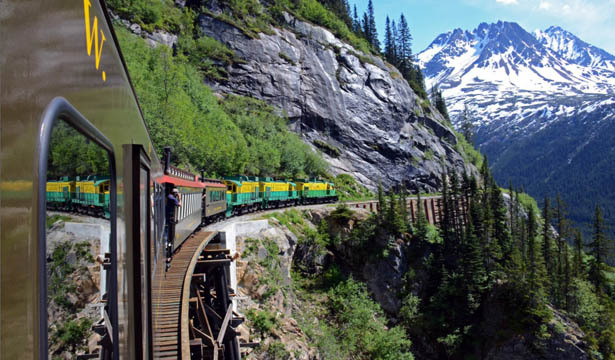 This preferred train ride runs from Skagway, Alaska to Fraser BC, climbing almost 3,000 feet while traversing steep trestles and long tunnels while immersed in the stunning scenery of the famed White Pass. You will see shimmering glaciers, towering waterfalls, and other natural wonders before arriving at the historic Fraser Station. After a brief visit you will board a bus back to Skagway, travelling along the magnificent Klondike Highway - voted one of the most scenic in North America. Keep your eyes peeled for wildlife of every sort. Passport required for this trip. Plan on arriving early. Children two years of age and younger are free. Snacks available at the depot, but no food is served on board to the train. All train cars have a bathroom and are heated. This tour is recommended for all ages.